Health guidelines give a prescription for the kind and amount of exercise needed for the best health benefits. Moderate-intensity aerobic exercise is recommended for either 30 minutes a day for five days a week or a total of two hours and 30 minutes per week. This can be as simple as brisk walking. Find out which activities count as moderate exercise and how you can tell if you are in the right zone. A moderate level of activity noticeably increases your heart rate and breathing rate. You may sweat, but you are still able to carry on a conversation. You can talk, but you can't sing. You know you are exercising compared with doing a daily activity such as walking at an easy pace, but you are not huffing and puffing. The Centers for Disease Control (CDC) defines the moderate-intensity heart rate zone as 50 percent to 70 percent of maximum heart rate. Your maximum heart rate varies by age and can be found by using a heart rate zone chart or calculator. To measure your heart rate, you can take your exercise pulse or use a heart rate monitor, heart rate app, or get a wrist-based heart rate from a fitness band or smartwatch. How Long Should You Exercise at Moderate Intensity? At least 10 minutes of continuous physical activity is needed for it to be considered a session of exercise. While 30 minutes per day are recommended, you can break that up into two to three shorter sessions, each at least 10 minutes long. As you build your ability to exercise, aim to get even more moderate activity. If you can boost your moderate aerobic exercise time to 300 minutes (five hours) per week you will have even more health benefits, according to the CDC. If you are not able to use your legs, you can achieve moderately-intense exercise by using a manual wheelchair or a hand cycle (ergometer), in addition to swimming or water aerobics. If you can use your legs but you don't tolerate walking or jogging, try bicycling or swimming. An easy walk of under 10 minutes doesn't count as moderate-intensity aerobic activity. You may achieve over 10,000 steps per day on your pedometer, but unless you do some sessions of 10 minutes or more at a brisk pace, you haven't achieved it. Just adding steps on your pedometer at an easy pace or through shorter bursts of movement doesn't count. Many activity monitors, pedometers, and smartwatches track continuous movement at a pace they consider to be right for achieving moderate-intensity exercise to vigorous-intensity exercise. They report this as exercise minutes and exercise calories burned. It is a good way to check and be sure you are getting enough exercise of the right kind. You can build moderate activity into your lifestyle by walking briskly for at least 10 minutes. Start by walking at an easy pace for a couple of minutes. Then pick up the pace for 10 minutes. You can incorporate this into your daily routine. Suggested times to walk are during work breaks or lunch, or before or after the workday when walking your dog. You can walk indoors, outdoors, or use a treadmill. By using good posture and walking technique you will make it easier to achieve a brisk pace. After you are comfortable walking briskly for 10 minutes at a time, you can begin to extend your walking time by a few minutes per session each week. 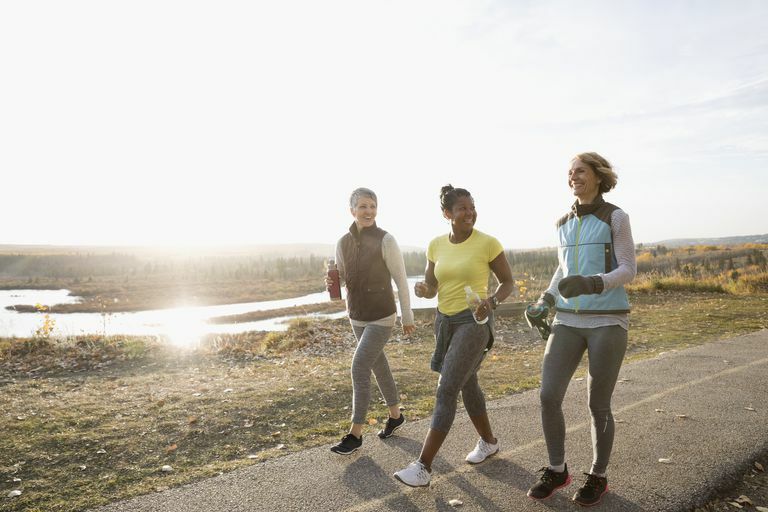 Enjoy different walking workouts for variety, varying the intensity with bursts of walking faster, jogging intervals, or adding hills or treadmill incline. You may discover that you can't walk fast enough to boost your heart rate into the moderate-intensity zone. If so, think about other activities such as cycling, swimming, or using an elliptical trainer where it may be easier for you to achieve a higher heart rate. Enjoying moderate physical activity will help keep your body in working order. Don't be distressed if you can only do a little at first. Give yourself time to build your endurance. Then make the time each day for the activities you like best. Current Physical Activity Guidelines. Centers for Disease Control and Prevention. https://www.cdc.gov/cancer/dcpc/prevention/policies_practices/physical_activity/guidelines.htm. Garber CE, Blissmer B, Deschenes MR, et al.Quantity and Quality of Exercise for Developing and Maintaining Cardiorespiratory, Musculoskeletal, and Neuromotor Fitness in Apparently Healthy Adults.Medicine & Science in Sports & Exercise. 2011;43(7):1334-1359. doi:10.1249/mss.0b013e318213fefb.